Eurocom reveals Neptune, a new line of fully upgradable workstation notebooks with support for NVIDIA 3D Vision. You can check out the configurability of these systems over here. 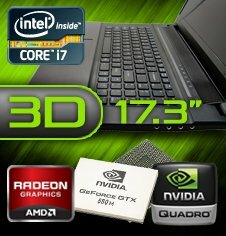 Eurocom Corporation (www.eurocom.com), a developer of long lifespan, fully upgradable Notebooks, high performance Mobile Workstations and Mobile Servers is now offering a Mobile Workstation capable of supporting NVIDIA® 3D Vision™ with NVIDIA GeForce® GTX 580M and 560M GPUs. Eurocom offers 3D Vision support on the Neptune Mobile Workstation through a built in-emitter, 3D active shutter technology, a 120Hz display and supported NVIDIA graphics cards. The EUROCOM Neptune comes complete with an NVIDIA 3D Vision Kit which consists of one pair of 3D Vision glasses and USB cables. Each lens of the glasses operates at 60Hz, and alternate to create a 120Hz 3-dimensional experience. The EUROCOM Neptune is a 17.3” fully upgradeable notebook that is ideal for professional applications as well as gaming and entertainment use. “The EUROCOM Neptune is a very thin and sleek system that is ultra powerful, being able to support the most powerful mobile technology currently available. From the most powerful graphics in the world, Intel Core i7-2960XM Processors, 32GB RAM, and three SSD drives” says Mark Bialic, Eurocom President. Supporting 3D technology provides users with an immersive 3D experience in games, movies, and any content with built in depth. • Storage: up to 3 physical drives, SSD, hybrid or mechanical, up to 3 TB of storage.